Most people understand the advantages of Raw files, but when might shooting JPEGs be a better option? Shooting in Raw is widely viewed as the better approach to shooting JPEGs for more serious, considered photography, but does that mean everyone should aim to competently abandon JPEGs? Not necessarily. More and more photographers are citing the many benefits of shooting JPEGs over Raw files, to the point that they will be happy enough to use these straight out of the camera. It certainly makes sense when you consider that cameras are not only becoming more intelligent, but that they are also now highly customisable, allowing you to achieve the shot you want with less fuss. It's not a case of simply using one format or the other at all times, rather knowing which makes the most sense in a given situation. After all, shooting in Raw does have many advantages over JPEGs, and these are well known. Still, in the interests of balance, here are eight advantages of shooting in JPEG. Although the file size of an image partly depends on what it is you're capturing, Raw images tend to be significantly larger in size than JPEG files. This could be as little as two or three times the size, or potentially even six or seven – and this has many drawbacks. Your cards filling up faster will be the most immediate disadvantage, and it will also usually take longer to get these images flushed out to your memory card. The need for more, or larger, hard drives means it will ultimately cost you more to store all this information, too. 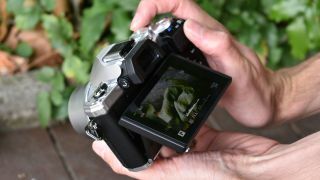 Of course, one alternative here is to capture small or medium Raw images, although this won't always be appropriate if you want to get the most out of your camera's sensor. Shoot sports or any other action photography? Your camera’s buffer will fill up faster if you capture either Raw or simultaneous Raw and JPEG images, and this may well slow you down when shooting a burst of images. Switching to the JPEG option will allow you to shoot for a longer burst. In fact, some cameras claim to allow this up to the capacity of the memory card used. Just make sure your memory card is fast enough to cope with a large stream of images, as this could be a bottleneck. Just as shooting on film disciplines you into trying to get the result you want in camera, so can the knowledge that you don’t have a Raw file to fall back on when shooting a JPEG. Disciplining yourself in this way means you’re more likely to adjust the relevant processing parameters to your liking, and make more effort to get it right if you review your images and find something isn’t quite right. If you’re used to shooting Raw files you may not be aware of just how much is possible in camera. From checking focus with the zooming controls and using highlight warnings to guide you with exposure, to finely adjusting sharpening settings to suit your specific subject, you may find your camera is more capable than you think. While you may be able to get great results with time and care in post-production, it’s entirely possible that your camera would do just as good a job – and in an instant. Today’s cameras are sophisticated enough to instantly process out defective pixels, reduce noise only in specific areas of the scene, and to lift shadowy areas to better balance exposures, so it makes sense to take advantage of these time-saving measures. The typical camera will also offer many colour preset options, and the majority of models allow you to either tweak the individual parameters of these presets or to create brand new ones, should none suit your taste. One of the lesser-mentioned benefits of digital capture over film is that the camera can automatically process out a number of minor lens corrections, such as vignetting, distortion and chromatic aberration. If you began shooting on film where this wasn’t possible, you may already appreciate how useful and time-saving it is to have this happen without you even thinking about it, particularly if you’re used to using wide-angle or wide-aperture lenses, where things like distortion and vignetting can be problematic. Of course, it is possible to apply these to Raw files using software, although for everyday images that aren’t likely to be processed, the convenience of instant lens corrections in a ready-to-use JPEG makes a great deal of sense. Sure, it’s a good idea to stick to Raw when it matters, but for casual snapshots is it always necessary? Not only will you not process every image you take but you’re unlikely to view them all at the kinds of sizes where small differences in sharpness and noise reduction make much difference. Many modern cameras have at least one button which can quickly be used to activate Raw recording, which means that you can shoot in JPEG for everyday shots and quickly switch to Raw (or Raw and JPEG) for the images that matter, so check if this is possible on your model if you think it might benefit your shooting. As soon as you capture a JPEG, it’s ready for use and supported by a wide range of devices. If you need to quickly send it to someone or upload it to a social networking site, or alternatively print it out, copy it or simply view it on a computer or another display, you can do so. Raw files, by contrast, need specific software programs that have been updated to support that particular camera. Files from particularly new models may not even be supported by your editing program of choice, meaning that you need to wait for an update from the manufacturer before editing it here. The gift of time is one of the greatest advantages of shooting JPEGs. No additional processing of Raw files means you have more time to yourself and you won’t have too wait as long to download, sort through and store all of your images.